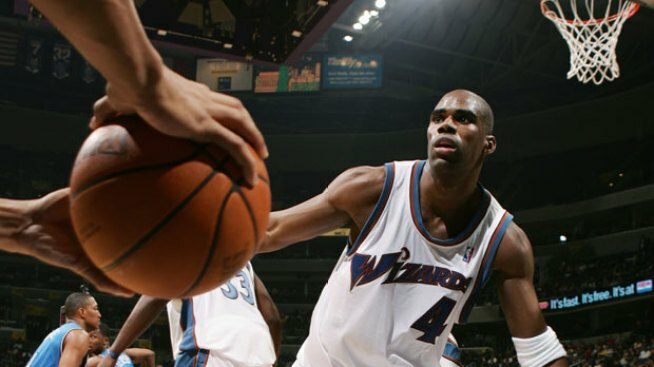 2008-09 was the second straight season that Jamison led the Wizards in both points and rebounds per game. As LeBron James has been named the NBA's MVP, leading many to immediately move past a "congratulations" and wonder how many he'll get, it's time to reflect back on the Wizards' season and who was their most valuable player in such catastrophic circumstances. Naming an MVP of a 19-63 team that tied the worst 82-game mark in franchise history is like shopping for steak at 7-Eleven. Sure, it's sustenance, but it won't sit well in your stomach nor leave a good taste in your mouth. To the shock and dismay of Wizards fans, the season was doomed for the beginning -- from in mid-September when Gilbert Arenas unexpectedly announced a third knee surgery to early October when Brendan Haywood was diagnosed with 4-6 months of inactivity due to a wrist injury. But that didn't stop a 32-year-old Antawn Jamison from busting his rump from miserable start, to even worse finish, missing only the last game. His points (22.2) and rebounds (8.9) per game each amounted to the third best averages of his 11-year career, and also were '08-'09 team leads. Neither Jamison's field-goals made and attempted totals (674/1,441, both good enough to rank fifth most in the NBA), nor his minutes per game (38.2, ninth most in the NBA), made his game sloppy. His 7.1 turnover percentage ranked third-best league wide. So why didn't Jamison pack it in and go through the motions? Simply put, the guy is oozing with pride, which could actually work to his detriment. Jamison clearly sacrifices his body for the team, but now questions surface, wondering if he'll make another type of sacrifice. Would Antawn be willing to serve his team if he weren't starting? Jamison's struggles on defense are well documented. And while the inefficiencies have been easy to ignore in the past, that might not be the case with the Flip Saunders regime change. Most valuable Wizard in '08-09? Undeniably. But last season is sooo last season. If Jamison wants to retain more than valued personal statistics, he'll consider being the same prized asset coming off the bench.